Welcome to Forestry Commission England’s first edition of Tree Health News. This is a new publication that has been created due to the high demand for regular pest and disease updates from the sector – for the sector. This edition is very much the first of an evolving document and we want to ensure this is as useful to you as it possibly can be. We aim to publish three times a year, to be rolled out fully in 2015, and based on feedback to this edition, we will consider having five regionalised versions of a national e-newsletter. We intend to publish updates, guidance, case studies and would like to involve partner organisations if you feel you have information to share. 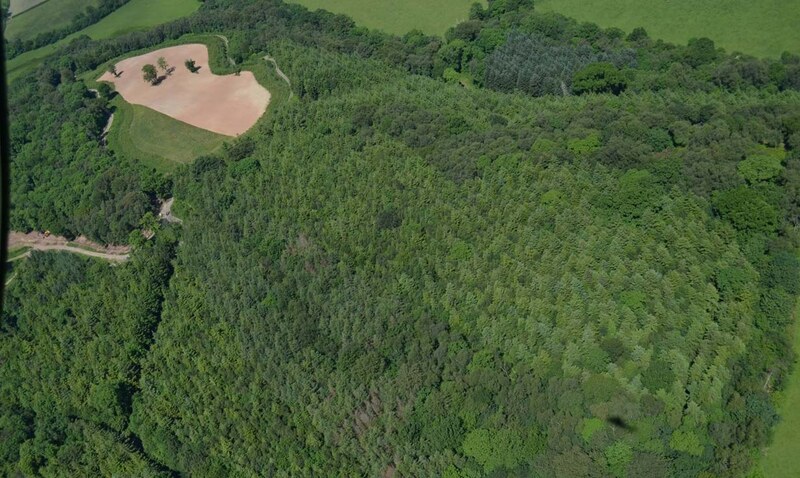 Woodland owners who have co-operated with the Forestry Commission’s Phytophthora ramorum control programme have been thanked for helping to achieve a slowdown in the spread of the disease in England. The Forestry Commission has published an update on its 2014 programme of aerial surveys for Ramorum disease in larch woodland. At the completion of the flying programme, a significantly smaller total area of concern was identified than that recorded in the previous two years. The Commission says this slowdown is partly due to the public-spirited co-operation of affected woodland owners with statutory requirements to fell infected trees to slow the spread of the disease. Increased government funding to protect Britain’s trees from exotic pests and diseases has already paid off in the form of a number of interceptions of suspect items in materials imported from abroad. Thanks to the extra resources, Forestry Commission Plant Health Service inspectors have made three times more interceptions this year than last of evidence of wood packaging that has not met Great Britain’s landing requirements. 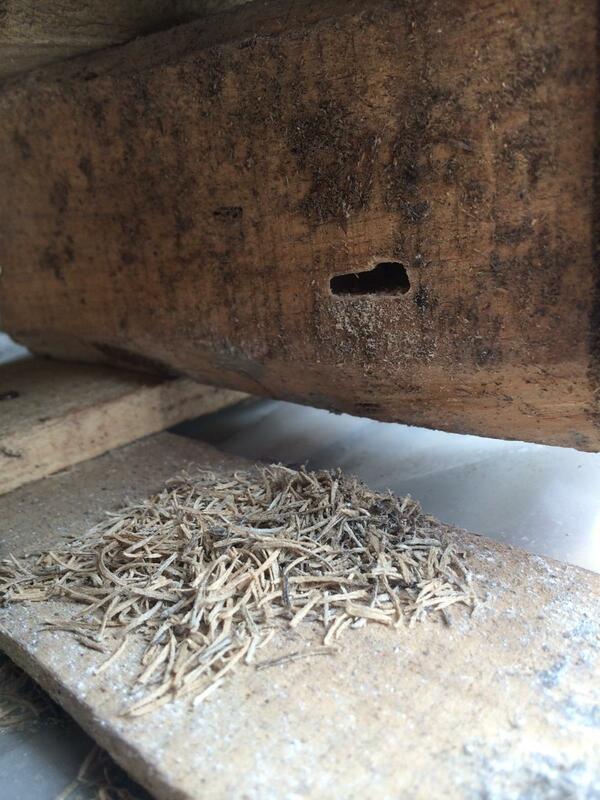 In three cases there was evidence of live insect activity in the wood. The Commission is currently working to raise the awareness of importers of steel goods of their obligations to ensure that they do not import goods in non-compliant wooden packaging. The first cases of Chalara ash dieback in trees in the wider environment in North-west England have been confirmed. Until this year, the region’s only cases of the disease, which is caused by the Chalara fraxinea fungus, had been found in young, recently planted ash trees. Sadly, however, more than 50 locations of infected trees in the wider environment were confirmed this year. Most of them are widely distributed across Lancashire, with the known extent of the cluster extending into southern Cumbria, greater Manchester and western North Yorkshire, including the Yorkshire Dales National Park. It is not clear how the infection came to the area, but the two main routes for spreading the disease are in the form of spores blown on the wind or on infected plants brought into the area for planting and which begin to produce spores. Within my role as Plant Health Team Manager, I manage the tactical, operational and strategic deployment of the Plant Health team in England. Over the past 12 – 18 months, my main responsibility has been to build and develop a new, slightly larger, team and to ensure we’re approaching the work required in a clear and focused way, capable of dealing with the challenges presented by a new approach to tree health post-Chalara. Over the last ten years there has been a significant increase in the number of pests and diseases attacking our trees. This increase has dramatically highlighted how dependant we have become on a limited range of tree species. Forestry Commission guidance shows how species diversification is at the core of woodland adaptation and ensuring resilience in the future. Preliminary results from laboratory tests and field trials of selected fungicides for treating ash trees with Chalara ash dieback for their efficacy are now available on the Fera website. 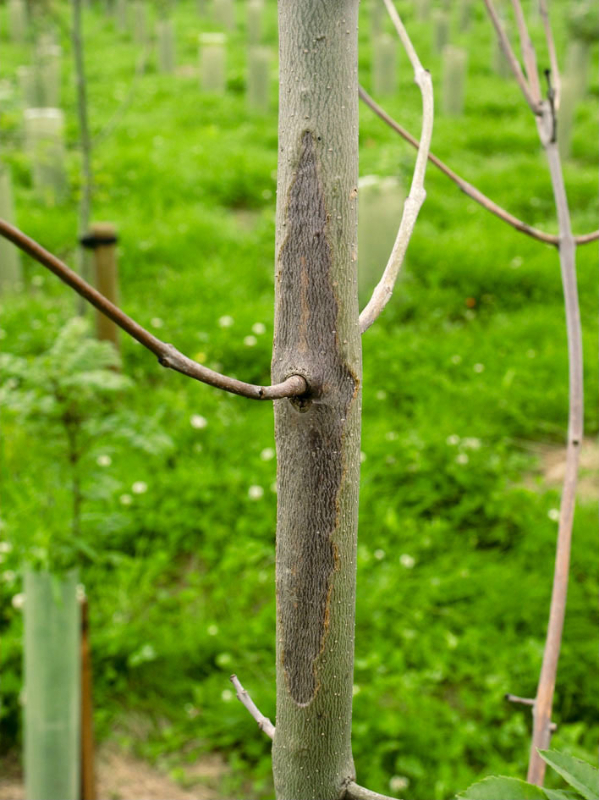 Generally speaking, treatments for tree diseases have limited applications because they can be difficult and expensive to use, and because the impact on other, harmless or beneficial organisms can be unacceptable. However, they can be useful for protecting individual trees or groups of trees of high amenity, cultural or heritage value, and it is hoped that the final result of the trials will identify products which can be used effectively for this purpose. Dothistroma septosporum, the fungus which causes Dothistroma needle blight (DNB), started to have a noticeable effect on Corsican pine on the Public Forest Estate in the late 1990s and early 2000s. In summer 2014, the Forestry Commission, working with Forest Research, carried out an initial survey to determine the status of DNB on Scots pine in England. The survey looked at Scots pine by sampling sites across England. The survey showed that DNB is widespread in Scots Pine as, of the 575 sites surveyed, 450 (78%) showed Dothistroma infection, with occurrences ranging from 60% infection (34 of 57 sites) in central England to 89% infected sites (162 of 183 sites) in the north of England. A follow-up survey is planned for this winter to revisit a subset of the positive sites to investigate severity of infection by examining needle retention. 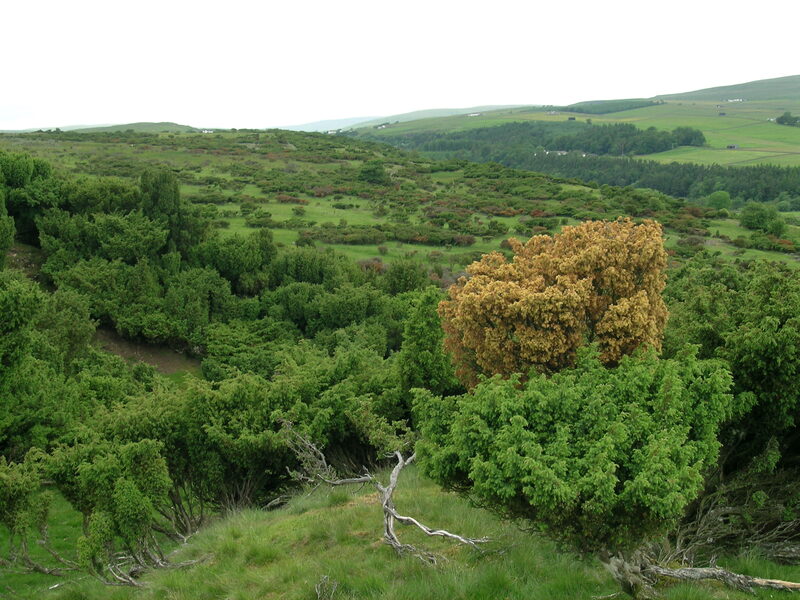 Phytophthora austrocedrae is an aggressive, fungus-like pathogen that poses a serious threat to juniper trees in Britain. Juniper is an important native species, and a significant proportion of the small area of juniper woodland in Britain is protected. Phytophthora austrocedrae was first reported in the UK in 2011, and infected trees have now been found at sites across Scotland and the north of England. The Forestry Commission has recently published a new pest alert on this disease and there is guidance available. Observatree is a new project that is working with government scientists, plant health officers and volunteers to establish a tree health early warning system. It is a partnership project led by Forest Research, and partners include the Forestry Commission, Woodland Trust, National Trust and Fera. It is supported by Defra and funded by LIFE+. To find out more about the project and sign up for the newsletter, visit the website. We really want this to be useful to you and would welcome your feedback on this newsletter to help inform future editions. Do you think we need regionalised versions of this – or will one national newsletter be the best option for you? Is there anything you’d like to see in this? Do we have the right kind of information? Please contact us. the Forestry Commission’s pest and disease pages.